Ranging from annoying to excruciating, the sensation of a stopped-up ear can be disconcerting at best. Always check with your doctor before attempting any home treatments for ear problems to rule out serious infections or other problems requiring medical attention. In many cases, however, she may approve the use of a home remedy to treat your stopped-up ear. 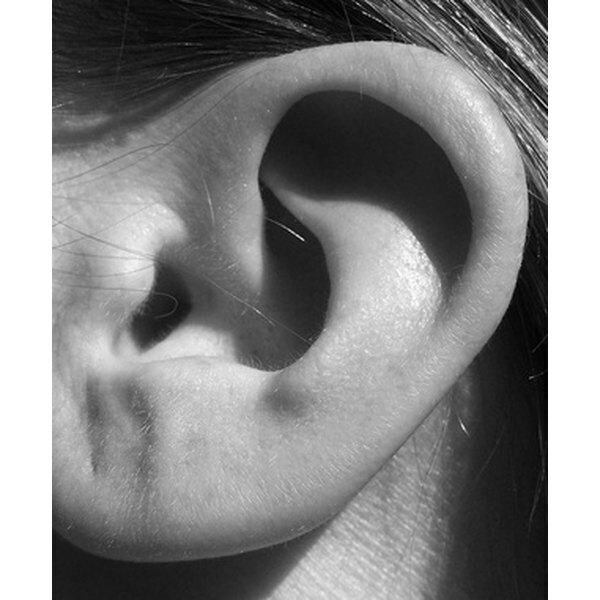 Stopped-up ears may reveal themselves by muffling noise, through pain or simply from a feeling of fullness or pressure in the ear. Depending on the cause of your ear problem, other symptoms may include ear and nasal discharge, dizziness and fever. Several conditions may lead to a sensation of having a “stopped up” ear, according to MayoClinic.com. They include excess ear wax, bacterial infections such as “swimmer’s ear,” sinus problems and even changes in air pressure on an airplane. Prepare a warm compress at the first sign of a stopped-up ear, according to the home remedy website Grannymed.com. The compress soothes a variety of ear problems that may be leading to that feeling of fullness, including minor ear infections and fluid build-up. Soak a washcloth in almost-hot water and wring it out, or wrap a hot-water bottle in a hand towel. In each case, apply the compress to the ear to ease pain and promote fluid drainage. Herbalist Barbara Griggs suggests using chamomile tea in place of water for the ear compress. Soften ear wax for several days before attempting to remove it, according to MayoClinic.com. Add a few drops of glycerin, mineral oil or hydrogen peroxide to the ear twice a day for up to five days. After the wax softens, use a bulb syringe to irrigate the ear canal with warm water. Squirt a small amount of water into your ear, tilt your head up and use your hand to “wriggle” your outer ear. Then tilt your head down and allow the fluid to drain. Gently dry your outer ear. Repeat the softening and irrigating several times, if necessary. If you or your child experiences a stopped-up feeling while riding on an airplane, yawn or chew gum to restore the air pressure balance, says MayoClinic.com. Swallowing also helps; many parents nurse or bottle-feed their babies during landings and takeoffs to prevent infant discomfort. Plugged ears from a cold or allergy may be “popped” by attempting to blow with your mouth closed and nostrils pinched. This method often opens obstructed Eustachian tubes. Never insert anything into your ear canal in an attempt to dig out ear wax or otherwise “pop” any blockages. Always check with a doctor to rule out serious bacterial infections or severe wax buildup, says MayoClinic.com. This step is especially important for children complaining of stopped-up ears.